The Conjuring 2 owes a lot to its predecessor. Both Conjuring movies have nearly identical frameworks. This time, though, all of the events are presented on a much larger scale, and the film overall is way more ambitious. There’s a lot crammed into 134 minutes; not everything works. But is it scary? Hell yes it is. If you’ve seen The Conjuring, or even the trailers for Conjuring 2, the plot is already obvious: Paranormal investigators/adorable married couple Ed and Lorraine Warren (Patrick Wilson, Vera Farmiga) are summoned to help a family that’s been besieged by something sinister. Conjuring 2 explores one of the best-known cases that the real-life Warrens ever got involved with, namely London’s “Enfield Poltergeist,” a.k.a. “England’s Amityville.” The Amityville reference comes after a prologue set at the notorious house from The Amityville Horror—another famous case that the Warrens were a part of. Lorraine and Ed Warren (Vera Farmiga and Patrick Wilson) in the Amityville house. Director James Wan knows that no matter what anyone thought in the 1970s, most audiences today will know that Amityville is now believed to have been a complete fabrication. He also knows that you can’t make a movie about the Warrens going to Enfield without mentioning Amityville, especially after that shout-out at the end of the first Conjuring. So he starts the movie in Amityville’s attic room with the iconic eye-shaped windows—it must be said, the entire film displays an incredible attention to period detail, right down to the accurately tacky patterned wallpaper—and with the psychically sensitive Lorraine in a trance. She “sees” the terrible mass murder that really did unfold in the house, but none of the alleged supernatural events that happened after. Instead, she has her own highly personal and terrifying vision, which will reoccur throughout the film and intensify each time. Amityville may have been a fraud, but Wan wants us to believe that Lorraine’s power—the central character in a movie that’s presented as “based on the true story”—is 100 percent authentic. The notion of hoaxes is further explored once we meet the British family who become the Warren’s next project. Times are tough in the Hodgson household, with frazzled single mother Peggy (Frances O’Connor) stuck raising four kids in a dingy North London council house. We see the family preparing for bed in a impressively unbroken bit of camerawork that flies in through an upstairs window and swoops around every corner, including through the Starsky & Hutch poster-bedecked bedroom occupied by 11-year-old Janet (Madison Wolfe) and her older sister. The Hodgsons spend most of the movie in a state of extreme freakout. Foreshadowing abounds: Janet has an Ouija board; her little brother plays in a shadowy tent that just looks like a place gremlins would want to hang out; and the creaky old house itself, dripping in sad, moldy tones of gray and green, feels like a magnet for negative energy. The conditions are right for a haunting—or for staging a fake haunting. Lorraine and Ed head to Enfield—with “London Calling,” literally the most cliched choice ever, on the soundtrack—at first merely to observe the strange goings-on at the Hodgson house. Lorraine is hesitant to stick her nose back into the ghostly realm since she’s been so rattled by her visions of a menacing figure that resembles Captain Howdy in a nun’s habit; this choice of imagery isn’t surprising given the film’s overt similarities to The Exorcist as well as its Catholic themes. (It also, understandably, evokes Poltergeist quite a bit.) Ed is just looking for hard evidence one way or another, so they can advise the Church on how to proceed. But while it’s assumed that the Warrens are the best at what they do, with Lorraine especially being uniquely gifted, they aren’t the only people who’ve taken an interest in the case. This is an important difference from the first Conjuring film, which took place in an isolated farmhouse. Here, they’re in a city and the media—already interested in the Warrens, as we see early on when they appear as talk-show guests alongside a sneering academic—has descended on the story, along with paranormal experts like the sympathetic, hopeful Maurice Grosse (Simon McBurney) and the very, very doubtful Anita Gregory (Franke Potente). The experts gather for a rare moment of downtime. Their motivations may differ, but everyone’s there for the same reason: to get proof. Is Janet faking the whole thing? Should the Warrens, who desperately want to help the family despite Lorraine’s inability to sense a presence in the house, take the “leap of faith” they can’t stop talking about when discussing how they came to have their own beliefs about the spirit realm? And what is the audience supposed to think, since we see scary events happening onscreen with our very own eyes? Without giving too much away, we get explanations (natural and supernatural) for all of the above, because The Conjuring 2 is not the kind of movie that wants to confuse you about reality. It is not that high-concept; it merely wants to entertain you, by which I mean scare the bejesus out of you, with all the disturbing license an R rating allows. A lot of the scare tactics Wan uses are familiar. He’s good at playing “Gotcha!” in the dark. But he’s also good at crafting a general mood of unease. Just one example: there’s an eerie scene in which the Warrens make contact with the Enfield entity, and we see something change form over Ed’s shoulder in the shot, though the background stays deliberately blurry. We can sense it, but we can’t quite make out what it is. In that instance, our imaginations do all the work picturing something much worse than anything Wan could’ve put onscreen. 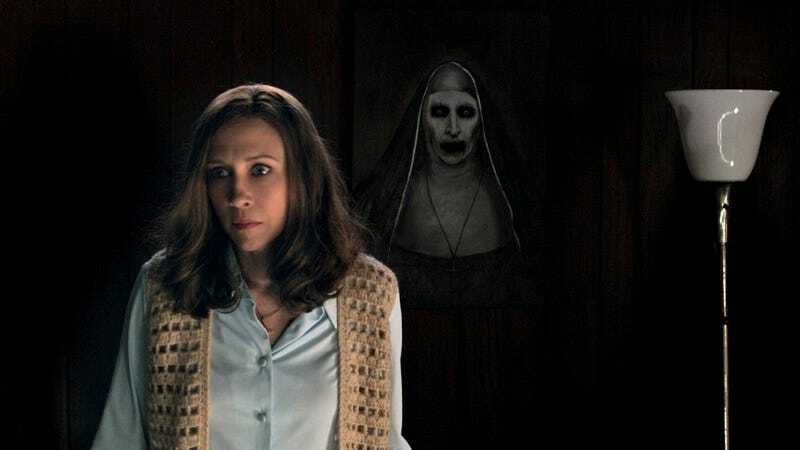 With so many side tangents—including a drawn-out scene in which Ed delights the Hodgsons with a spontaneous Elvis imitation—The Conjuring 2 teeters on the brink of being too sprawling. It also builds to a climactic crisis that’s solved a little too easily, especially considering the multiple layers that conceal the truth about what’s really going on in Enfield. Of course, the Warrens are the focal point, with Farmiga and Wilson digging deeper to show what’s made their marriage such a success, and why their faith in each other is nearly as important as their devotion to Catholicism. That’s the crux of the film, and if it feels a little earnest and thickly-applied by the end, after 134 minutes of battling skeptics and demons, it feels mostly well-earned. And for what it’s worth... Captain Howdy Nun is legit scary. If you want to win Halloween, get yourself a copy of this outfit, and let the screams roll in. The Conjuring 2 opens June 10.